We've all been there. Work is going great, you have everything under control and then boom! 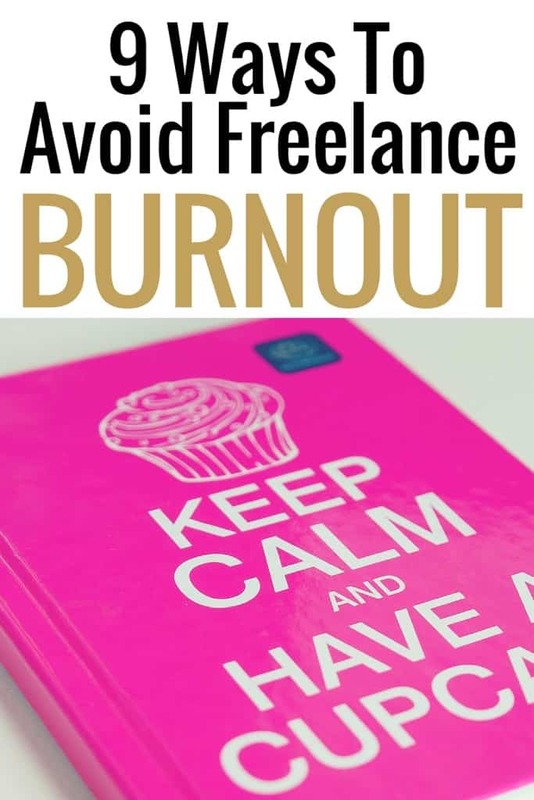 All of a sudden you are exhausted, tired of working and starting to burnout. I was a part time blogger for less than a year before quitting my day job and becoming a full time blogger. Please note, this post was updated in February 2019. After four years of starting my blog, I have made more than $900,000 online. You can read all my income reports here. This includes income primarily from my products and courses, freelancing, ads and affiliate income. For me, this is quite a bit of money in a short amount of time. Frankly, this is not anything close to what I would have made at my day job in the same time period. Getting to this point has had some minor challenges, with the biggest challenge being burnout! While I absolutely love what I get to do every single day, I do have the occasional ups and downs, which is normal with any job! I am a constant work in progress and always trying to work learn how to work smarter, not harder. 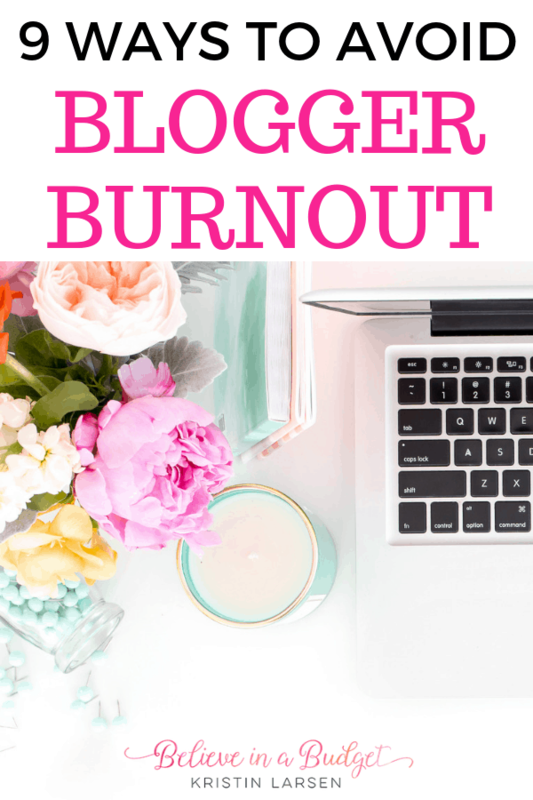 Here are some things I have done to avoid blogger and freelance burnout in the past. As a full time blogger or freelancer, you might be working more hours that you like or even imagined. Being organized is one of the best ways to set yourself up for success. If you struggle with getting it together, here are 18 tips on how to organize your life right now. What is the best way you stay organized? If you are a paper person, use a planner or nice notebook. I always feel a little more polished when my tool set makes me feel good. If you are an online person only, use Google Drive and start organizing folders and documents. Use Google calendar on your computer and phone. Most bloggers and freelancers aren't overnight success stories. Be prepared to invest in yourself and take the time to get where you want to be. If you work hard, success can happen! I made over $13,000 from my blog in only 10 months as a newbie blogger. It is more realistic to develop a plan for how long it will take to achieve your goals rather than assume you will be able to accomplish everything you want overnight. With that in mind, visualize where you want to be in the immediate future, short run and long run. Give yourself a date that you think you can accomplish a task and check it off your to do list. I like to print out my workbooks and guides and keep them in a binder. If you prefer to keep your notes online, try to create a folder that can hold all of your blogging documents. This way you will have everything in one place. Ok, I know you aren't really looking at your stats all the time. When I first started blogging, I got a little too obsessed with numbers and accounts. I used to check my Google Analytics, ad networks and social media accounts multiple times a day. Not only was this mentally exhausting, but a distraction as well. Now I check my Google Analytics a couple times a week, just so I can be aware if a post has gone viral or if my traffic has tanked. It's also much easier to switch to automated apps such as Tailwind to share posts and schedule social media so you aren't having to be on social media websites all day. When it comes to ad networks and affiliate sales, I like to look at my account once a week to make sure everything is working. I try not to get too caught up in this as it's a distraction and takes time away from my work day. One of the best ways to get more things done is to outsource some of your blog or freelance responsibilities. I know what you are thinking if you are new to blogging or freelancing. How can I outsource something when I am still struggling to make money? I totally get it. When I was a brand new blogger, I had to make a couple of tough decisions early on. I was not tech-savvy at the time (I still struggle in some areas), and I had spent hours trying to work on my blog's theme. I finally made the decision that it was smarter for me to hire someone to help me work on a few things then spend anymore time on it. The freelancer I hired was able to help me check off a few things on my checklist at a really fair rate. While he helped work on my blog, I was able to focus on ways to bring in money and focus on my own freelance business and grow my blog. Sometimes you have to be ready to spend money and invest in yourself. This doesn't mean you need to hire a full time employee or virtual assistant. Instead, hire for project help as needed. Figure out what takes up most of your time and then add up how much time it takes you to accomplish this. Then figure out what you else you could accomplish and make money doing if you were outsourcing this. If you need advanced or specialty help, consider bartering your skills with someone else. See if there is someone in their beginning stages of their freelance career that can provide you a specialty rate so she can grow her portfolio or testimonials. A great place to look is with Facebook groups. Look for Facebook groups that are blogger or freelance friendly where you can talk about your services and promote yourself as well. For many businesses and bloggers, using Pinterest is the number one way to get traffic, so this is something easy to outsource and get a great return of investment. Pinterest VAs can help you drive traffic to your website, which can ultimately help your blog make more money or help clients find your freelance services. If you want help with your Pinterest account, hire a Pinterest virtual assistant or Pinterest a manager with my free Pinterest VA finder. Another area you can outsource is with template design. I love creating Pinterest templates for my blog posts and clients. My pins have performed really well for myself and my clients, so I started offering them to the public. So many bloggers are not design savvy, and these customizable pin templates are a breeze to use and implement. My friend Chonce from My Debt Epiphany figured out what works best for her and now outsources to save time and money. Life happens and not everything goes according to schedule. It is easy to spend too much time with a client and neglect a different project. The days are always too short to check everything off your to do list. I am a big believer in prep work, so I like to plan ahead for the worst scenario incase something does go wrong. When it comes to blogging, I try to stay four to six weeks ahead with my blog content. This includes writing new content and updating older blog posts. I haven't always been ahead on my blog content though. This is why I have a couple of rainy day posts tucked away in case my schedule gets too crazy and I can't post when I need to. While I no longer accept very many guest posts on my blog, depending on my editorial calendar, I will ask a fellow blogger if they are interested in sharing a blog post on my site. For example, I don't have experience with every side hustle. But if I can find someone that can share their experience on a specific topic, this gives the other blogger exposure and can provide valuable content for my readers at the same time. This also frees up some of my time so I don't have to personally create new blog content. My social media posts are also pre-scheduled for the most part. While I still use Pinterest and Facebook to post something in the moment, I prefer to use a scheduling tool to save time and plan out all of my posts. It can become an easy habit to feel like you have to work all the time in order to be successful. The 4 Hour Workweek is a great book to read if you want to learn how to be more productive in a shorter amount of time. Set aside some time every day to exercise or eat lunch away from your desk. I wear a FitBit and get a reminder to get up and move during the day. My dogs are always ready to go for a short walk or play in the yard, so taking multiple trips outside for even a few minutes at a time can make a big difference! I keep a set of stretch bands and light weight dumbbells near my desk. Even with a few minutes of use, I get my heart rate up and feel good. Every little bit of movement counts. It's not easy, but try to disassociate from work to spend time with family and friends. It's healthy for you! Before I quit my day job to freelance and blog full time, I had some negative conversations with myself. I worried I wouldn't be good enough and no one would hire me. I was quick to write myself off as a failure instead of being optimistic. I was letting my fear of failure control my life! After some soul searching, I realized I am good enough and I can do this. I recognized that my success won't happen overnight and instead will be gradual. Now I focus on the positives and count my blessings that I am able to support myself on this freelance journey! This used to be a tough habit for me. I would come up with blog ideas and think I was on a roll with the direction of my blog. Then I would read a blog that I admired and feel like I was totally doing things wrong. It took me a while, but I realized that I can't compare my blog to anyone else's blog. Sure, it's nice to read what everyone else is writing about, check out how nice their website look and see what cool freelance gigs they were working on. But none of this was really helping me and just making me feel bad about myself. Instead, I like to read other blogs as a reader only; not a competitor. I prefer to cheer my peers on, get really excited for them and then go back to my own blog and do my own thing. Seeing other freelancers and bloggers do great things motivates me to try harder, and not compare myself to them. We are all in this together. If you admire a fellow blogger or find yourself in similar circles as other freelancers, reach out and say hello. It's nice to have someone you can bounce ideas off of, compare stories and ask questions to without feeling embarrassed. This is also a great way to network and come across new job opportunities! If you could outsource anything, what would it be? Great tips to keep pushing forward without the burnout. For me, organization is key, if I am not organized or have a plan I am up a creek without a paddle. But if I am organized and planed I can execute like no tomorrow. It’s all about the prep and planning or else I am the same as you! Great suggestions. As a freelancer for over a year I have found that taking one day off per week completely is necessary for me. Allows me to disconnect, do what I need to personally, but also stay connected as a project manager. My team works everyday of the week. I will answer one of them if it’s necessary. It’s helped me fight off burnout. It’s so healthy to take take a day off, even in the early stages of freelancing! The most ideal approach to get yourself out of a rut is to take a break and return to work with a fresh perspective and clear mindset. Freelancing can be brutal because even if you plan ahead really well you could still end up getting a bunch of lucrative assignments all at once with a tight timeline. Overall I’ve avoided burnout (for the most part) by keeping tight control of my calendar and to-do list. I work ahead on everything I can to make time/space for those last-minute requests. I would love to be in your position. I definitely did better with time management when I worked my full time job, but I had less freelance clients then. It’s a struggle! Love this! So many check their stats way too often. I check mine once a day, which is probably still too much, but I only check it for one minute to make sure everything is okay and running smoothly. Ha, I check mine sometimes twice a day still! I’ve had an increase in traffic lately, and have been trying to figure out if I need up to upgrade my Bluehost plan or if my site’s starting to run slowly. Love this tips! I’m experiencing some burnout right now for sure. I’m supposed to be finishing up all my freelance assignments this week and it looks like I’ll have to work into the weekend because I keep accepting more work for some reason, haha. I need to work on knowing my limits better. Outsourcing has helped me a ton, as you know 🙂 and I would have been burnt out for good a long time ago if I tried to do everything myself. Ha, I’ve said yes to everything this month…and now I’m working every day lol. Oh well. I am ready to pull the trigger on outsourcing after reading your post! Love this post!! I totally go through freelancing burnout like once a month LOL. But then work will slow down, and I start to miss it, so I seek new work 🙂 I love your tips about taking a break and reaching out to fellow bloggers/freelancers. I view everyone as a friend and not a competitor! There is room for ALL of us to succeed! And there is no better way to get back your motivation than by chatting with others who are going through it too! Freelancing is the never ending hustle! I’m similar to you – if I slow down, I totally start to seek more work and get paranoid I need to be working more. I don’t know why I’m like this haha. I would like to outsource cleaning the bathrooms! Okay, not freelance related, but my vote! These are great tips! Yes, might as well make it the whole house + laundry! These are some great tips! I fall into two categories most of the time: total obsession and/or I just don’t care right now. I really need to find a happy medium.